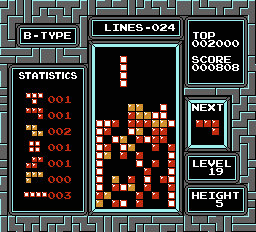 NES Tetris (USA) "Mode B" in 00:50.53 by Chef Stef. This movie completes the B-mode of Tetris at level 19-5. Its goal is to clear all blocks from the screen upon the final line cleared. And of course it aims to do this as fast as possible. Note: The author manipulates luck by pressing up+left+right to slow down the block's falling speed.